Supplier & Manufacturer of Axial Flow Pump. Our product range also comprises of Polypropylene Chemical Process Pump, Pinch Valve and Centrifugal Chemical Process Pump. We manufacture a wide range of Axial Flow Pumps. 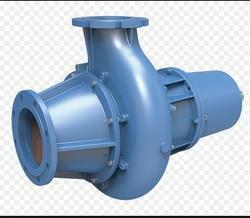 AF series Axial Flow Pump is also known a Propeller Pump as it allows the fluid to enter the impeller axially. 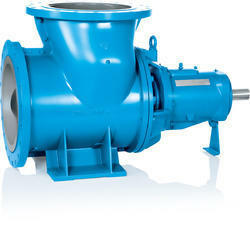 Axial flow pumps use the propelling action of the impeller vanes on the liquid to develop pressure. Axial flow pumps can be adjusted by changing the pitch of the blades on the propeller. This makes them useful for either high-flow / low-pressure applications or low-flow / high-pressure applications. Axial flow pumps are frequently used in industrial settings as circulation pumps that work in conjunction with sewage digesters or evaporators. Axial flow pumps are also used in heat recovery systems, nuclear reactor water circulation, and high volume mixing applications. Horizontal Axial Flow Pump offered comprise single stage and double suction pumps with a centrifugal operating mechanism that provides for consistent performance support as demanded by the customers. Finding application in suction and supply of water and chemicals, these pumps can be made available in different operating model choices to pick from. Some of its features include pump head for 9 to 140 meters; suitable for use in areas like mines, urban water supply, power stations; coming with durable drive belt or coupling support; open impeller option; option of soft packing seal/mechanical seal and others. Vertical Axial Flow Pumps offered comprise high-performance electric pumps that find usage in irrigation and drainage applications. Other than this, these pumps also find usage in applications involving supplying water to mine, urban construction, water supply works and others. Some of its features include suitable for use in low lift head and high flow-rate conditions; offering efficient performance; coming with superior safety from corrosion; can handle conveying temperatures of 50oC; option of OEM configurations as demanded by the customers. 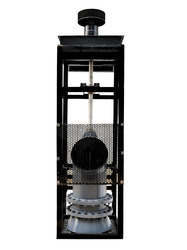 We manufacture a wide range of Axial Flow Pump For Distilleries. AF series Axial Flow Pump is also known a Propeller Pump as it allows the fluid to enter the impeller axially. Axial flow pumps use the propelling action of the impeller vanes on the liquid to develop pressure. Axial flow pumps can be adjusted by changing the pitch of the blades on the propeller. This makes them useful for either high-flow / low-pressure applications or low-flow / high-pressure applications. Axial flow pumps are frequently used in industrial settings as circulation pumps that work in conjunction with sewage digesters or evaporators. Axial flow pumps are also used in heat recovery systems, nuclear reactor water circulation, and high volume mixing applications. We manufacture a wide range of Axial Flow Pumps For Breweries. 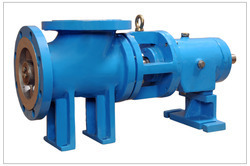 AF series Axial Flow Pump is also known a Propeller Pump as it allows the fluid to enter the impeller axially. Axial flow pumps use the propelling action of the impeller vanes on the liquid to develop pressure. Axial flow pumps can be adjusted by changing the pitch of the blades on the propeller. This makes them useful for either high-flow / low-pressure applications or low-flow / high-pressure applications. Axial flow pumps are frequently used in industrial settings as circulation pumps that work in conjunction with sewage digesters or evaporators. Axial flow pumps are also used in heat recovery systems, nuclear reactor water circulation, and high volume mixing applications.